Amongst the myriad of entertainment, shopping and dining take a stroll through the renovated wax museum now one of the world's largest. The museum is replete with theChamber of Horrors, Hall of Religion, the historic Library of U.S. Presidents, the spectacular Recreation of King Tut's Tomb and the unique Palace of Living Art, where the world's most famous masters, and their masterpieces come to life through the magic of wax artistry. Open Daily: Most businesses open around 9am and remain open until at least 10pm. It is wheelchair and stroller accessible, although the sidewalks are crowded, signs and displays may impede flow. Many corners have curb cuts. 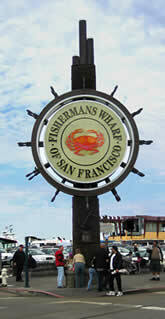 Restrooms are available to customers in most restaurants, and public restrooms can be found in Ghirardelli Square, Pier 39 and near the iconic Fisherman's Wharf sign. Most, but not all businesses above the ground floor are accessible by elevator. Visit Ghirardelli Ice Cream shop and try the hot fudge sundae. Their fudge is the best and we strongly recommend ordering an extra serving of fudge on the side. While fun during the day, check out Fisherman's Wharf at night, when all the lights are lit and the energy changes to a little more carnival-like. Some businesses validate parking, mostly restaurants, so be sure to get your parking validated when you order. 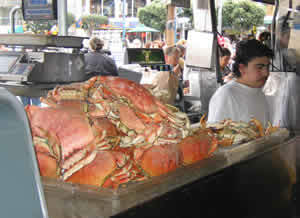 Take Columbus Avenue or Embarcadero northwest toward Fisherman's Wharf. Parking is challenging and the the structures are somewhat expensive. Sometimes it is worth parking farther out and walking in. It saves time because of slow traffic in the main wharf area and parking there often fills up.